The elegant design of the Oster Counterforms Blender is part of its charm. This blender/food processor can be purchased in a mixture of black & stainless finish or all black. The Oster Counterforms Blender can be used as a processor, a chopper and a blender. Families tight on counter top space can appreciate the compact nature of its footprint. This blender is designed to make creamy frozen drinks with ease as it is powerful, it holds a lot, and it’s powerful enough to take care of any job. That’s not to mention the stainless steel design that looks great on any counter top. All Metal Drive for lasting durability. 600 watt (0.8 horsepower) reversible motor for accurate blending and food processing. 7 pre-programmed speeds including pulse. 48oz 6 Cup Glass Pitcher that is dishwasher safe, scratch resistant and thermal shock tested. The Oster BVCB07-Z blender is a stainless-steel counter top kitchen appliance that includes a six cup glass jug along with 7 speed settings. The 7 pre-programmed speed functions offer one touch results along with a pulse function. This is ideal for those difficult to get food chunks that frequently seem to escape your blender’s cutter. The BVCB07 blender also offers a great metal drive system designed for long lasting durability, along with a reversible motor unit which makes for optimal blending, a function not many blenders have. The unit is driven by a Six hundred watt motor that’s made to slice through the hardest ice using its stainless steel ‘ice crusher’ blade. It will chop through even large ice chunks, it can be filled with frozen fruit and it will quickly blend them up. The blenders glass jug is dish washer safe, it’s scratch proof and it’s shock-tested to stand up to even the most excessive of conditions. The starting price for the Counterforms Blender is an attractive price, especially when you consider the additional functionality of this device as a chopper and a food processor. It does a lot more than similarly priced blenders are able to do. The biggest complaint about the Oster Counterforms Blender is that it is loud. It’s important to remember that most blenders are loud, especially when blending ice or other hard materials in them. There have also been a few complaints that gaskets break easily and leaks occur as a result. Be gentle when dealing with your blender to avoid this and if it does happen, there are generally replacement parts that can be ordered and delivered rather quickly. When it came to the consumer reviews, for the most part they are extremely positive. One consumer said that she needed a good blender to make smoothies every morning. After weighing her options, she chose to go with the Oster BVCB07-Z blender. She was so glad she did as she has never seen a blender go through ice and frozen fruit with such precision. And another consumer loved the fact that the blender was extremely powerful but also affordable. When it comes to bad reviews, we could only find one. One consumer bought the Oster BVCB07-Z and it quit working after a few days. Oster sent the consumer a brand new unit and the unit quit working again. This led us to believe that it was the consumer’s outlet and not the blender that caused the problem. Especially since there were so many positive reviews and that was the only negative. 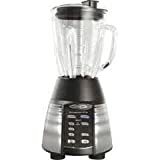 This Oster BVCB07 blender has received a very good percentage of five star ratings on Amazon, scoring 203 from a total of around 331 reviews, this averages more than 4 stars overall! Overall, we can gladly recommend the Oster BVCB07-Z blender for anyone who loves frozen drinks and for food processed items that require a little bit more power than average blenders. There are a few flaws to be considered but none of them appear to be fatal flaws and the Oster name is a trusted name in the business of building better blenders. 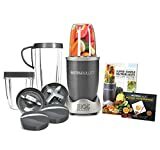 This is not a high performance blender, but it is feature rich piece of equipment as far as the average kitchen appliance goes. Consider the amount of space that can be saved by combining a blender and food processor, along with a chopper in one little space on your counter top. The bottom line is that it’s fairly powerful and it’s affordable, so probably won’t be beaten by anything else in its class. When the time comes to purchase your next blender, be sure to give the Oster Counterforms Blender a second look.